I’ve always been intrigued by labyrinths, but I’ll admit that I’ve also been a bit intimidated by them. While I consider myself to be a spiritual person, walking a labyrinth seemed to be a bit like trying to engage in a yoga practice without knowing how to do the asanas properly. What if I did it wrong? I was pleased to learn earlier this week about a free labyrinth tutorial class to be held at the San Martin Campus of St. Rose Dominican Hospital in Las Vegas. This one-hour session began with a short intro by a labyrinth educator, followed by our small group experiencing our own labyrinth walk. The labyrinth is a universal image that represents the path of life. There is only one path to follow, and you cannot get lost or come to a dead end while on your journey. Labyrinths have been around for over 4,000 years and are present in almost ever major religious traditions. 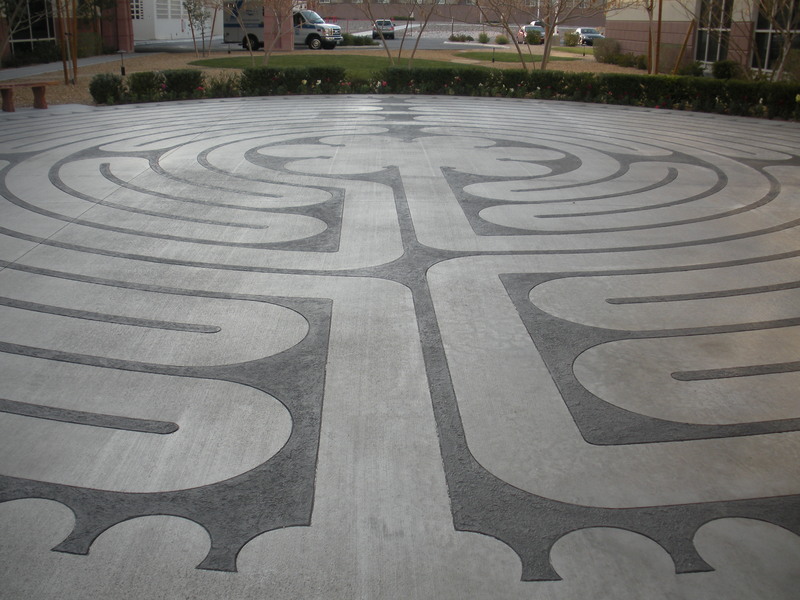 As St. Rose Hospital is a Catholic-affiliated hospital, their labyrinth is modelled after the style used at Chartres Cathedral in France. The labyrinth at St. Rose Hospital is almost a 1/8 mile path to the center of the circle. One way to explore the labyrinth’s journey is to consider it a three-fold path. Your walk to the center is to release and quiet yourself; your time in the center is to be open and receive; your journey outward is to take what you gained back into the world. The symbolism I found in my own labyrinth journey today is that it was not so much about the final destination, but it was more about the path along the way. Although there were nearly 10 of us walking the small labyrinth, I only needed to worry about running into the person in front of me (i.e. my immediate obstacle). So often I am caught up in planning and goals and getting to where I want to be (the end result), that I neglect the impulse of the moment. This was my lesson for today. To learn more about labyrinths, check out the website of the Labyrinth Society. They even have a highly-useful Labyrinth Locator, where you can find the closest labyrinth to your area of the world. This entry was posted in Healthy Living, The Simple Living Experiment and tagged labyrinth, mantra, meditation, reflection, simple living, spirituality. Bookmark the permalink. Fine that you share your experience with the labyrinth with the “whole” world, and here with a WordPress Blogger. OMG! Did you find the Minotar of Minos in the Labryrinth? What about David Bowie, was he there too? I used to go to Grace Cathedral in San Francisco to walk the labyrinth and always found it powerful. When I lived on the Navajo Reservation I had a walk I would do every day, and I would pick up a stone, and bring it on my 2 mile walk, then throw it down the cliff, where I would listen to hit hit the canyon walls till there was silence and then return. It was my labyrinth. Now that I am here in Las Vegas, I was pleased to hear we have a labyrinth here, and today I will walk the path in peace and healing. I hope the labyrinth here has continued to help you on your continuous journey of life.